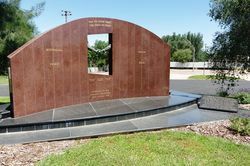 Cowra Australian-Italian Friendship Memorial is a polished red granite wall on a three-stepped polished black granite base. In the centre of the wall is an aperture in which are two bronze arms shaking hands. The Cowra Italy Friendship Monument was officially opened on Australia Day 1998 to celebrate the Italian link to Australia. In particular it was erected in recognition of the Italians prisoners-of-war and Internees held Cowra during World War Two. 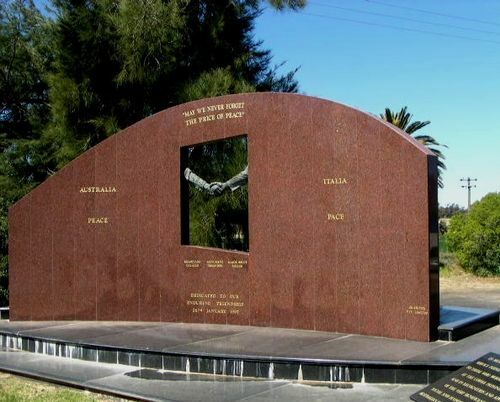 "May We Never Forget The Price Of Peace"
To Those Who Worked And Were Interned At The Cowra Prisoner Of War Camp And In Recognition And Appreciation Of The Very Significant Cultural, Social and Economic Contributions To Australian Society By The Italian People.